I am a huge fan of wall decals - they are such an easy way to decorate any room and they always look so professional and sharp! My latest wall decal is from Leen the Graphics Queen and I just LOVE it! Their vinyl decals are the perfect way to personalize your home. They have been making vinyl decals for over thirteen years so you know they do it right!! They are mess free, easy to install, fun and you get to choose the size, color etc. They can be put on walls, windows, doors, mirrors, any flat clean surface. They use interior grade matte vinyl. This special vinyl is made for interior use and has a matte finish for that hand painted look we all love! There is no clear outline or shadow at all, just the color of your choice. 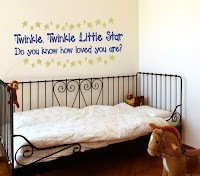 I generously received the Twinkle Twinkle Little Star Nursery Wall Decal. This is a vinyl decal that reads "Twinkle Twinkle Little Star, Do you know how loved you are?" and feature lots of little stars. It measures 22" x 44" and comes in TWO colors of your choice. I was so excited to receive this amazing wall decal for my daughter's nursery! I had been searching and searching for just the perfect wall decal in a star theme to match her room. I love the message and I love that I got to choose two colors! They have 45 colors available and they matched to my theme perfectly! The start of our decal project! The decal was super easy to apply (although my husband is sure a pro at wall decals these days...) and the colors were vibrant and the font was super cute! My husband hard at work doing a great job! I absolutely love the little stars hanging from the capital letters and it just brightened up my daughter's room and made it so fun and colorful! The Finished Product!!! I love it!!! Win It: Leen The Graphics Queen is generously offering (1) $40 gift certificate to a lucky winner!